If you need to turn heads at any event, we have the affordable answer for you. Utilizing state of the art technology, we offer banner prints on a wide variety of stock and custom materials, that are long lasting and visually compelling. From super sized banners for outdoor advertising--to small banners used for indoor promotions of all types, our color print banners are a highly efficient means of attracting new customers and for advertising your company's services and products. Banners are probably the most ubiquitous advertising media you'll find today. They're everywhere: from supersized building banners to smaller streamlined banners which you could put on the doorway. However, not all banners are made alike. Some are more attractive than others. When you're designing your banners, you should take these things into consideration. You have two things to consider when you're choosing the size of your banner: your budget and the number of people you'd like to reach. While standard doorway banners are much cheaper than an architectural wrap, you have to consider that architectural wraps (when done right) are much more impressive. Of course there's always the middle path: wall banners. These are also impressive and quite reasonably priced. Don't be afraid to consult our expert team of graphic artists for advice. They can let you in on some of our secrets. For example, it's always alright to ask them what sizes get printed the most. From here, you can decide on whether you'd like to join the bandwagon, or take on the risk and be unique. You can choose from a wide range of printing options when you order banners from us. We have colored, black and white, and monochromatic printing options. Black and white and monochromatic banners might be cheaper, but this would still depend on the design you've chosen. The darker your banners are, the more they would cost. Try to explore lighter designs and play around with the elements. You can also ask for assistance from our resident graphic artists. No matter what color modes you're choosing, just make sure that you're submitting high resolution image files. You'd want to avoid pixilated images on your banners, no matter what size you've chosen to use. Always strive for balance when you're placing the objects in your banners. Try not to make the banner too text heavy because people won't read it unless they're really interested in what you're announcing. At the same time, your banner can be image-heavy, but it should have enough text to give enough information about the event or announcement you're making. Unfortunately, striking a balance in design is more instinctive than something you can actually learn. If you're having trouble assessing if your layout is well-balanced or not, we can have a graphic artist help you with that. The material of your banners should be able to withstand nature's challenges, especially if you're placing it outdoors. For outdoor applications we use lamination to prevent the colors from fading and the material from deteriorating. Most people pick vinyl because it's manageable, resilient and water-resistant. 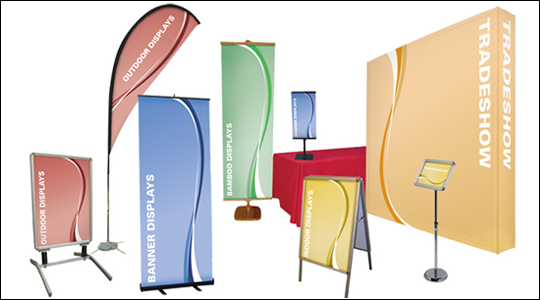 You'll be happy to know that we have the widest set of banner media you can possibly ask for. You won't have any trouble picking the right material for your banner printing needs. We'll be more than happy to walk you thru the process contact us today to see how we can help.